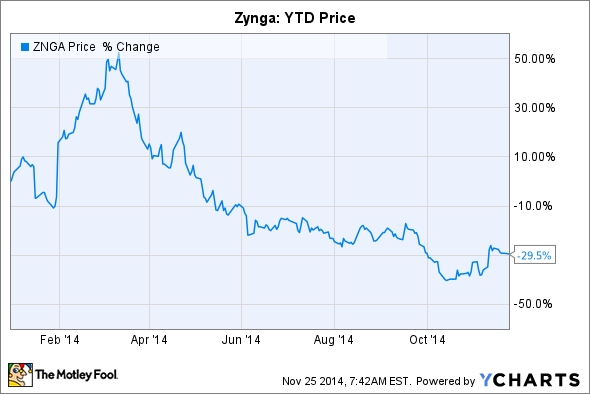 Can Zynga Stock Bounce Back in 2015? After dropping 30% in 2014, can Zynga win back gamers with new games? Zynga (NASDAQ:ZNGA) stock has plunged nearly 30% since the beginning of 2014, due to an exodus of users, widening losses, and a lack of new hit games. At the end of the third quarter, Zynga had 112 million monthly active users (MAUs) and 26 million daily active users (DAUs). That's down from 133 million MAUs and 30 million DAUs in the prior year quarter. Revenue fell 13% year-over-year to $177 million as it posted a net loss of $57 million, keeping it on track to lose over $200 million by the end of fiscal 2014. This means that Zynga will have lost more than $800 million over the past six years. Its adjusted EBITDA margin came in at just 1% -- down from 5% in the prior year quarter and 8% in the previous quarter. Amid all these bearish numbers, can contrarian investors find reasons to be bullish on Zynga? Zynga's three core games -- Farmville 2, Zynga Poker, and Hit It Rich -- accounted for 61% of its top line during the third quarter. The remainder came from other online games and advertising. Unfortunately, interest in all three games has waned, according to their rankings on App Annie. Source: App Annie. *iOS version, download rank among all U.S. Games. The rapid declines of Farmville 2 and Hit It Rich are troubling, since it means that Zynga must monetize its shrinking gamer base more effectively to generate a steady stream of revenue. Unfortunately, Zynga's payer conversion (free to paid player) rate was only 1.8% last quarter -- a decline from 1.9% in the second quarter and only a moderate improvement from a 1.6% rate a year ago. Hit It Rich. Source: iTunes. However, Zynga's ABPU (average bookings per user) came in at 7.3 cents, up from 5.5 cents a year earlier and 4.7 cents in the third quarter of 2012. This means that while Zynga can't bring in new free players and convert them into paid ones, but it knows how to milk more money from its shrinking customer base. That's not surprising, considering that Bloomberg once reported (prior to Zynga's IPO in 2011) that 25% to 50% of the company's revenue came from 1% of its users. That lopsided figure, which indicates that Zynga's future is controlled by so-called "whales," hasn't changed. It's likely gotten worse -- a Feb. 2014 study by app testing firm Swrve revealed that half of all free-to-play games' in-app purchases came from just 0.15% of all players. Despite those problems, investors shouldn't overlook Zynga's green shoots of recovery. First off, mobile games accounted for 55% of its bookings during the third quarter, up from 30% a year ago. Zynga's New Words With Friends also became the number one iOS game in the U.S. in early October, according to App Annie. As of Nov. 23, the game was still hanging tough at #5. Words With Friends is free to download and mainly relies on ad-based revenue. New Words With Friends. Source: iTunes. Advertising is another bright spot for Zynga. Revenue at Zynga's "Advertising and Other" category, which accounted for 21% of its top line, rose 32% year-over-year to $37.2 million last quarter. That's a stark contrast to the 20% decline at its main Online Games division. Zynga attributed its ad revenue growth to "favorable contractual terms" with "new mobile advertising partners." Looking ahead, Zynga's 2015 pipeline includes Tiger Woods Golf, Real Housewives, and Bridesmaids-themed versions of Hit It Rich, and several games from newly acquired developer NaturalMotion. This shift from cloned games to licensed properties is a key part of CEO Don Mattrick's strategy, but it can be a double-edged sword. On one hand, licensed properties have built-in fan bases compared to original games. For example, Zynga's new licensing deal with the NFL resulted in the release of NFL Showdown: Football Manager in September. But on the other hand, additional licensing fees will increase Zynga's total expenses, which already climbed 14.9% year-over-year last quarter due to restructuring expenses. Launching more licensed sports games is a clear attempt to replicate the success of Electronic Arts' (NASDAQ:EA) mobile division, which also launched Tiger Woods and NFL (Madden) mobile titles in the past. Imitating EA is smart, since EA Mobile's MAUs rose 10.7% sequentially to 155 million last quarter, compared to Zynga's 13.8% sequential decline to 112 million MAUs. EA's success is firmly rooted in its mobile sports games, which saw MAUs spike 250% YOY to 40 million during the quarter, thanks to the popularity of Madden NFL Mobile and FIFA 15 Ultimate Team Mobile. Although there are a few glimmers of hope for Zynga on the horizon, they're not enough to offset its core problems -- declining users, a disturbing dependence on "whales," and three core games which are quickly losing their luster. Zynga stock is also extremely expensive at 89 times forward earnings. By comparison, Candy Crush Saga maker King Digital Entertainment only trades with a forward P/E of 8. This means Zynga's stock still has a lot of downside potential if it continues to lose users.